The Anaheim Angels' 2002 season was the franchise's 42nd, and it ended with the team's first American League pennant and World Series championship. The Angels finished the regular season with a record of 99-63, 4 games behind the Oakland Athletics in the American League West standings, but qualified for the franchise's first ever wild card playoff berth to return to the postseason for the first time since 1986. Outfielder Garret Anderson led the team with 123 runs batted in and a .539 slugging percentage, was selected for the AL All-Star team, and won the Silver Slugger Award. Jarrod Washburn went 18-6 with a 3.15 earned run average to anchor a pitching staff that allowed the fewest runs in the league. In the postseason, the Angels defeated the New York Yankees 3-1 in the American League Division Series, then defeated the Minnesota Twins 4-1 in the American League Championship Series to win the AL pennant. The Angels then won the World Series in dramatic fashion when, with a 3-2 series deficit to the San Francisco Giants, they overcame a 5 run deficit in the late innings of Game 6 to force a winner-take-all Game 7, which they won to clinch the series 4-3. The morning after the win, The Orange County Register celebrated the Angels' win with the headline "7th Heaven," referring to the popular television series and fact that it took seven games for the Angels to win the World Series, and in doing so, it sent them to seventh heaven. 2002 was also notable as the season in which the Angels debuted their present-day uniforms, colors, and halo insignia, which replaced the widely ridiculed "periwinkle" uniforms and "winged" insignia they had worn since 1997. It was also the last full season the team was owned by The Walt Disney Company, which sold its controlling interest in the team to present-day owner Arte Moreno in May 2003. The Anaheim Angels focus in the off season leading up to the 2002 season was on how to improve the Angels from the 2001 season when they finished an incredible 41 games behind the Seattle Mariners (who won an American League record 116 games) in the AL West. January 4, 2002: Aaron Sele was signed as a Free Agent with the Anaheim Angels. January 31, 2002: Donne Wall was signed as a Free Agent with the Anaheim Angels. February 4, 2002: Erick Aybar was signed as a Free Agent with the Anaheim Angels. February 7, 2002: Clay Bellinger was signed as a Free Agent with the Anaheim Angels. The Anaheim Angels' 2002 Spring training was Tempe Diablo Stadium in Tempe, Arizona and held a Spring training record of 17-15. March 16, 2002: Julio Ramirez was signed as a Free Agent with the Anaheim Angels. The 2002 Major League Baseball draft was held on June 4–5. With their 10-5 win over the Texas Rangers on Mon. 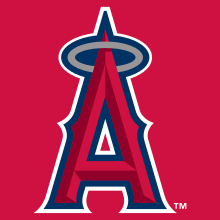 September 26, 2002, the Angels clinched their first (and only to date as of 2015) Wildcard berth. At this time, the Angels would be in the postseason for the first time since the 1986 season. The 2002 American League Division Series featured the Wildcard winner Anaheim Angels and the AL East champion New York Yankees. The series began on October 1, 2002 with the Angels splitting the first two games at Yankee Stadium. The Angels then proceeded to win the next two games, earning their ticket to the ALCS and winning their first postseason series in franchise history. The 2002 American League Championship Series featured the Wildcard winner Anaheim Angels and the AL Central champion Minnesota Twins. The series began on October 8, 2002 with the Angels splitting the first two games at the Hubert H. Humphrey Metrodome. The Angels then went home where they won three straight at Edison Field to earn a spot in the 2002 World Series. Infielder Adam Kennedy was the ALCS MVP. 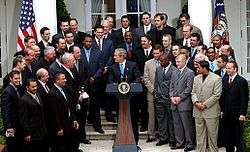 The 2002 World Series was the 98th edition of the Fall Classic, held from October 19–27, 2002. The series featured the American League champion Anaheim Angels defeating the National League champion San Francisco Giants, 4–3, to win the franchise's first ever World Series. The series was notable as being the first time since the 1995 inception of the wild card in Major League Baseball that two wild card teams would vie for the title. It was also the fourth World Series played between two teams from California (after 1974, 1988, and 1989, when the Giants last went to the World Series), and the first such series to not include the Oakland Athletics. It was also the last Series to be played in a full seven games until 2011. The American League champion had home field advantage during the World Series. Some radio games carried on KBIG–FM 104.3 because of broadcast conflict with the Los Angeles Lakers of the (NBA). ↑ "Baseball's Angels on High". CNN. Retrieved November 11, 2008. ↑ "Angels on Cloud Nine". CNN. Retrieved November 11, 2008.